“There’s mean things happenin’ in this land” go the lyrics of an old protest song written by John Handcox, an organizer with the Southern Tenant Farmers Union during the Great Depression. When Tom Juravich performed it this afternoon at the Bread and Roses Festival, none of the people singing along could have missed the song’s topical nature. If we listen to the economists, the Great Recession has been over for two years, but even members of that often detached profession acknowledge that the economic “recovery” is leaving thousands of people behind. With state and local budget cuts sending public sector workers to the unemployment offices, where they are joined by hospital workers and staff of nonprofit agencies whose employers have lost public funding, life is getting pretty mean. In my state, legislators are adding injury to insult by trying to impose new laws to reduce or eliminate the rights of workers to have a voice in the affairs of their workplaces. Mean things, indeed, are happening in this land. My friend Jan says it shouldn’t require two PhDs to explain how the erosion of workers’ rights and labor standards is related to the reduced clout of organized labor, but it can be useful to have academic research that proves the obvious. A recent article by Bruce Western and Jake Rosenfeld in the American Sociological Review uses equations and statistics to show the correlation between the decline in union membership from 1973 to 2007 with rising income inequality in the USA. “Unions helped institutionalize norms of equity,” they say, “reducing the dispersion of nonunion wages in highly unionized regions and industries.” In other words, wages go up across the labor market when unions are strong. When employers and their political allies succeed in busting unions, it’s not only the former union members who lose out. Today’s Labor Day Breakfast in Manchester brought together union members, allies from social justice groups, and friendly politicians, all united in efforts to stem the growing income gap by stopping the assault on unions. Mark MacKenzie, President of the NH AFL-CIO, praised public safety and utility workers who performed their jobs during the recent tropical storm and said, “We want a New Hampshire that cares about people, that cares about the middle class.” Governor John Lynch, who vetoed the “right to work for less” bill and the bill eliminating the state’s minimum wage, received more than one standing ovation and encouragement to seek a fifth term. That the moderate Lynch is seen as such a vital champion is an indication of how mean things have gotten. Speaker of the House Bill O’Brien and the ALEC/Tea Party faction that controls the legislature is determined to overturn the right-to-work veto. Legislative committees are ready to go to work on dismantling pubic sector collective bargaining and privatizing state departments. More than a dozen more anti-union bills are already on the agenda for the 2012 legislative session. If we want to preserve the middle class, it might behoove us to remember how the labor movement got started in the first place. 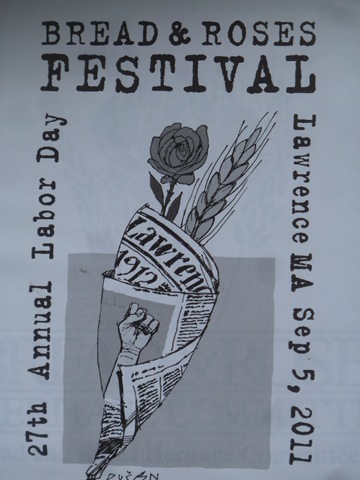 That’s one reason to attend the annual Bread and Roses Festival in Lawrence. The festival takes its name from a major textile strike that broke out in 1912 when 20,000 workers went on strike to protest cuts in wages and hours. For nine weeks in a bitterly cold winter, over 20,000 workers, mostly new immigrants, dared to challenge the mill owners and other city authorities. Thousands of picketers, many of them women, faced state militia armed with guns and clubs. But the strikers were generally peaceful. The two fatalities were both of strikers. A cache of dynamite, first attributed to the strikers, turned out to be planted by mill owners and their friends in a clumsy plot to discredit the strikers and their radical union, the Industrial Workers of the World. Observers were impressed by the strikers’ inter-ethnic cooperation, their soup kitchens, the important role of women, and their reliance on song to bolster their spirits and express their beliefs. Some women strikers reportedly carried banners proclaiming “We want bread, and roses too”, symbolizing their fight both for subsistence and for dignity. Although the use of the phrase here has never been documented, the “Bread and Roses Strike”, symbolizing the fight for subsistence and dignity, has stuck as the name for this seminal event. The strikers won public sympathy, drew on solidarity from workers in other communities, and won the strike. According to Steve Thornton, a union organizer from Hartford, 200,000 workers saw their wages rise because employers feared they would face similar strikes otherwise. 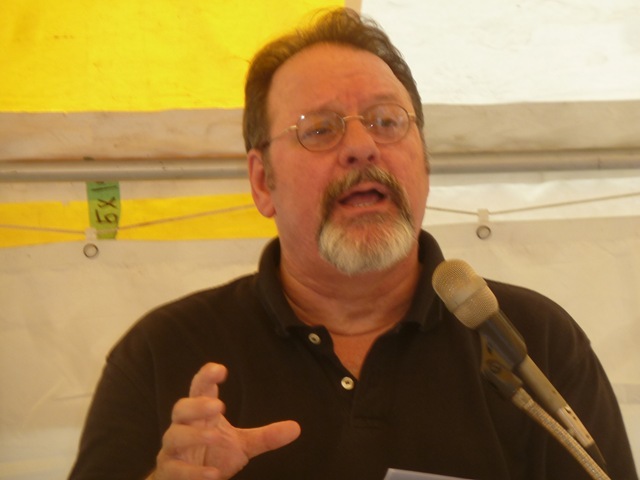 (Western and Rosenfeld would say the Break and Roses strike helped “materialize labor market norms of equity.”) Speaking in the festival’s labor history tent, Steve said the 1912 strike inspired unions in Connecticut and spread the concept of industrial unionism, an alternative to the craft unions of the American Federation of Labor that so easily led to divisions among workers in the same workplace. The IWW also spread the concept of free speech, which Steve said really meant little “until unions won it.” Their practice was to insist on holding public rallies in public places, even when public officials denied them permission. Sometimes they ended up filling the jails, not just the streets. The IWW slogan, “an injury to one is an injury to all” is due for a comeback. It would help if we can find some sociologists to prove it’s still true. For the second month in a row, New Hampshire Democratic and Republican leaders boasted that their policies were responsible for a drop in the unemployment rate, despite figures which show a lower number of jobs. According to the report on May employment released yesterday by the Bureau of Economic and Labor Statistics, the number of employed residents dropped by 1460 from April to May, while the number counted as unemployed dropped by 520. The net effect is a change in the “preliminary seasonally adjusted unemployment rate” from 4.9% to 4.8%. “This is clear evidence that our economic strategy here in New Hampshire is working,” said Gov. John Lynch, to the news that the state had fewer jobs in May than it did in April. To be fair, the statistics do show a 1% increase in jobs over the past 12 months. But it’s the unemployment rate that’s getting the attention it doesn’t quite deserve. 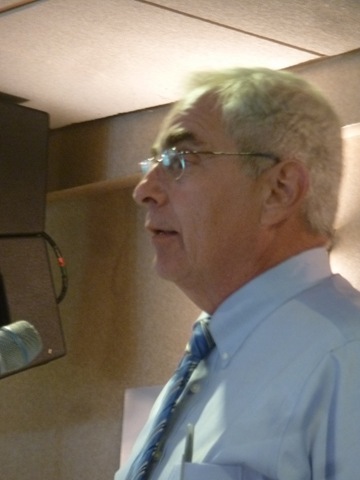 When New Hampshire’s Economic and Labor Market Information Bureau released the April unemployment figures on May 17, the state’s politicians were quick to issue statements claiming credit for an unemployment rate that fell below 5% for the first time since 2008. They should have looked more closely at the numbers before they hit the “send” button. “This is tremendous news for our workers, our businesses, and our state,” said Gov. John Lynch, claiming the low rate to be due to our “business friendly” climate. That might sound convincing until you look at the numbers. The official unemployment rate doesn’t really measure how many people aren’t working. To count, you have to be in the “labor force,” which means looking for a full-time job. If you’re not working and you’re not looking, you are not in the labor force and you don’t count toward the unemployment rate. From March to April, the number of new jobs grew by only 690, no sign of significant economic recovery. The main reason the unemployment rate dropped from 5.2% in March to 4.9% in April is that the state’s labor force fell by 3160 workers. Why they left the labor force – retirement, death, frustration with the lack of openings for decent jobs – is not apparent from the statistics. A slightly longer timeframe gives a more complex view: since January, the labor force has shrunk by 5060 workers and the number of those working has grown by 5080. Taken together, that adds up to a bit more than 10,000 fewer workers counted as unemployed, leading to a drop in the official unemployment rate from 6.1 to 4.9%. Neither set of figures should give politicians anything much to crow about. Scrooge gets a tax cut, while Bob Cratchit gets laid off. You can watch a video of my skit about unemployment, taxes, and other economic issues at http://www.youtube.com/watch?v=Vnbo8oKb5X0.